If you're thinking about buying a laptop any time soon, don't. Just don't do it. We're at a unique point in history, where weird and wonderful new hardware and revolutionary platform changes of every stripe will converge over the next few months. Need proof? Here's why you should wait. WWDC, Apple's developer-courting annual conference, starts next Monday, and we've been hearing for quite a while that Apple would make some dramatic changes to its MacBook Pro line. It's won't be just a spec bumps either, but a massive rethinking. The 2012 MacBook Pro will likely be packed with Ivy Bridge, which will give them a 30 percent jump in integrated graphics performance. They're reportedly going to ditch the hard drives and move to SSD, meaning better battery life and more speed. And they're going to eschew legacy tech, leaving just Thunderbolt and USB ports and an SD card reader, making them look a lot more like the Air. A better display and better graphics are also likely. 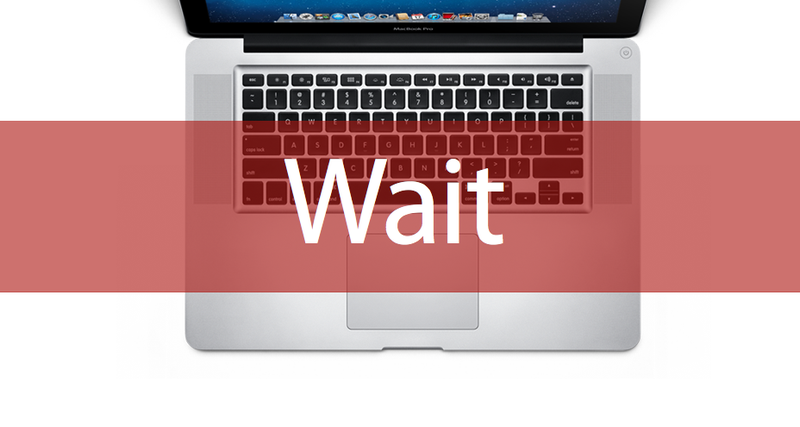 But in addition to the insides, the MacBook Pro's body is rumored to be getting its first makeover in ages. It's going to be slimmer, lighter, and even easier on the eyes. Prefer ultraportables or desktops? You should hold off, too. Next week's update may be even more sweeping than originally anticipated; apparently almost the entire lineup of Macs is getting a reboot. Apple reportedly has updated MacBook Pros, MacBook Airs, iMacs, and Mac Pros waiting in the wings to join the new MacBook Pros. And all of these guys are going to come preloaded with Mountain Lion, Apple's latest operating system that closely resembles its mobile platform—another step on the road to converging iOS and OS X. While obviously none of this is confirmed, there's bound to be a very big batch of new machines coming from Apple. Windows fans have even more to be excited about, and a lot fewer question marks. This week is Computex, meaning there has been a boatload of new rigs dumped in our laps. We've gotten looks at machines from nearly every major manufacturer: the Lenovo X1 Carbon, the Fujitsu Lifebook U772, the Dell Inspiron 14Z, the Acer Aspire S7, the Asus Transformer Book, the HP Envy 4, and more. And that's just the beginning. And many of these machines will come sporting Intel's third-gen Ivy Bridge processor as well. In a blog post last week, Intel said it knows of 110 Ivy Bridge Ultrabooks in the pipeline, even more than the oodles of computers we laid eyes on in the first two days of the conference. And why is it worth waiting for Ivy Bridge ultrabooks? Intel has specified that they're thinner—less than 18mm thick for sub-14 inch displays, and less than 21mm if their screens are bigger than 14 inches. Beyond that, they're more powerful, more secure, more responsive, and have better battery life and a high-speed I/O port (USB 3.0 or Thunderbolt). We don't have firm launch dates, but we know they're imminent, which continues on the pervasive theme of "wait." The other big elephant about to enter the room is Windows 8, which is just a few months away. Microsoft is essentially gut-renovating its venerable platform, and the new look is wonderful. From what we've seen in the Release Preview, it's gorgeous, but it doesn't ship until the fall. You can upgrade then, of course, for a small fee. But why not save yourself the trouble and get Windows 8 shipped? Maybe the best thing about Windows 8 is that it allows for all manner of unconventional machines. We've already seen a bevy of dual-display hybrid machines at Computex, like the Asus Taichi, and a bunch of other products that cross-pollinate tablets and ultrabooks. Asus actually brings several members to this misfit club, with the Tablet 600, a slate Tegra 3 with a detachable keyboard, and the Transformer Book, a laptop that morphs into a tablet. Both of these are also based on Windows 8, so if you're interested in this new, oddball breed of mutants, you'll have to hold out for a bit. And Computex isn't the only fountain of bizarre from which these hybrids are flowing. Toshiba this week also showed off the Satellite U845W, a super-wide Ultrabook tailored toward watching movies and TV and multitasking. It goes on sale next month. No matter what you want, you're just better off waiting. With three days left of Computex, WWDC upon us, and some solid time left before Microsoft actually drops the latest greatest Windows, there's just too much to look forward to. Drop your cash on something now, and you'll be left with that same feeling as a kid who didn't get what she wanted on Christmas morning, only to see your friends showing off their the shiny new goodness when school starts up again. And honestly, even if none of these amazing things appeals to you, you'd still be a fool to buy a laptop right now. As soon these new devices go on sale, the cost of current ones will drop. So even if the new stuff doesn't rev your engine, you're still better off waiting and saving a couple hundred bucks. Patience pays off, especially if you're in the market for a computer right now.